A father pays tribute to his son, who inspired many with his optimism during 39 years of living with a severe disability. 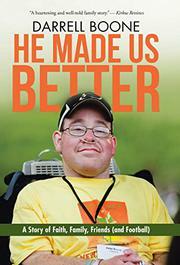 Debut author and freelance agricultural writer Boone’s middle son, Peter (1975-2014), had spina bifida. He was born with a high, large, open wound on his back and was given a poor prognosis. Luckily, medical advances made Peter part of the first generation of spina bifida patients to reach adulthood. But his was no easy ride: he was soon wheelchair-bound and over the years endured 80-plus surgeries and multiple hospitalizations. A particularly disastrous 1987 operation left Peter reliant on oxygen and a ventilator and unable to eat or speak normally; for nearly nine years, he communicated chiefly by mouthing words. It’s impressive how conventional a life Peter led despite intense physical trials: from elementary school onward, he attended regular classes; he learned to drive a customized van and attended his prom; and after getting an associate’s degree, he worked as a tutor at his old high school. Boone skillfully cuts between Peter’s major achievements and the challenges of daily life with a disabled family member; in particular, he is careful not to neglect struggles his wife and other sons faced. While telling Peter’s story as a straightforward yet absorbing chronological narrative, the author occasionally pauses to thank those who supported his family: Peter’s doctors, their Quaker congregation, and Joni and Friends (a charity founded by quadriplegic Joni Eareckson Tada), whose camps Peter attended and then volunteered in. Peter’s obsessive love of sports, especially football and the Purdue teams, is a strong theme running throughout the moving book—“although he couldn’t be an athlete in body, he was a great one in spirit,” Boone writes. Crucially, Peter and his family never stopped seeing the lighter side of things, as in a vivid scene in which flooding forced them to deliver Peter home by tractor. It’s no wonder that his high school instituted the “Peter Boone Mental Attitude Award” in his honor or that 400 attended his memorial service when he succumbed to a coronary thrombosis. A heartening and well-told family story.